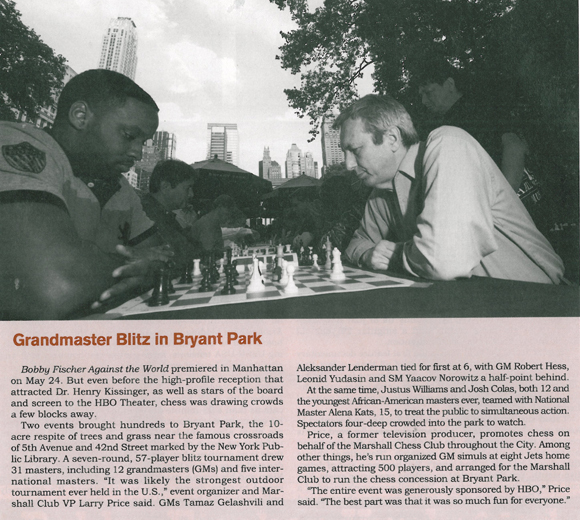 To celebrate the premiere of Bobby Fischer Against the World, HBO Documentary teamed up with Bryant Park's chess concessionaire Marshall Chess Club to hold a blitz tournament and a simultaneous challenge in the park. The event attracted one of the largest gatherings of highly skilled chess players... ever. The occasion was featured in the August issue of Chess Life Magazine. Read what they had to say about the event, or take a look back at our video of the blitz portion.